MEXICO CITY (AP) — Pope Francis wraps up his trip to Mexico on Wednesday with some of his most anticipated events: a visit in a Ciudad Juarez prison just days after a riot in another lockup killed 49 inmates and a stop at the Texas border when immigration is a hot issue for the U.S. presidential campaign. He also scheduled a meeting with Mexican workers, grassroots groups and employers in an encounter at which he was likely to repeat his mantra on the need for dignified work for all and "land, labor and lodging." Francis' final events cap a whirlwind five-day visit that focused heavily on the injustices faced by Mexico's poorest, most oppressed and vulnerable to the country's drug-fueled violence. He sought to offer comfort while taking Mexico's political and religious leaders to task for failing to do good for their people. He has denounced abuse of pre-trial detention, called life sentences a "hidden death penalty" and urged a worldwide end to capital punishment. As pope, he continues to check in with Argentine prisoners he ministered to as archbishop of Buenos Aires. But he also tells inmates not to let their suffering lead to violence — a message he may repeat given the deadly riot last week at Monterrey's Topo Chico prison, where rival gang factions bloodied each other with hammers, cudgels and makeshift knives. Eight more inmates were injured Tuesday in a brawl at another prison. Ciudad Juarez's Prison No. 3, where Francis planned to speak to inmates and visiting family members, is relatively calm these days. But it has seen violent clashes before that reflected the chaos outside its walls. Times have changed. Last year, the city's homicide rate was about 20 per 100,000 people, roughly on par with Mexico's nationwide average of 14 per 100,000 — and well below what is being seen in current hotspots of drug violence such as the Pacific resort city Acapulco and surrounding Guerrero state. Many businesses that closed during Juarez's darkest years have reopened. Tourists are again crossing over from the United States to shop and dine. People say they no longer have to leave parties early to avoid being on the streets after dark. "At least now we can go out. We go to the parks. We can walk around a little more at that time of night," Lorena Diaz said, standing under a huge banner of Francis hanging from her second-floor balcony. Diaz, who along with about 30 family members secured tickets for Wednesday's Mass, has followed news of Francis' tour and welcomed his calls for Mexicans not to tolerate corruption and violence. "He's telling us to get out of the trenches, not to close ourselves off," Diaz said. 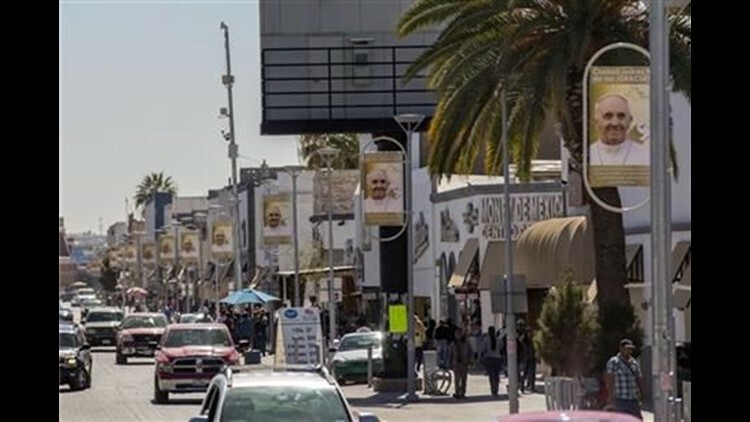 Juarez's proximity to the U.S. has brought a job boom at hundreds of foreign-owned assembly plants known as "maquiladoras" that manufacture clothes, electronics and other goods to be shipped north. But many workers say conditions can be poor and pay low. At a recent demonstration, protesters said they were struggling to get by on wages of just $45 a week. Migration is a theme close to the pontiff's heart. He has demanded that countries welcome those fleeing poverty and oppression and denounced what he calls the "globalization of indifference" toward migrants. It's a message that hasn't gone down well with some in the U.S., at a time when border apprehensions of families and unaccompanied minors rose significantly in the last three months of 2015. On the eve of Francis' trip, Trump criticized the pope's border stop. "I don't think he understands the danger of the open border that we have with Mexico," Trump said in an interview with Fox. "I think Mexico got him to do it because they want to keep the border just the way it is. They're making a fortune, and we're losing." "The pope always talks about migration problems all around the world, of the duties we have to solve these problems in a humane manner, of hosting those who come from other countries in search of a life of dignity and peace," Lombardi said. Associated Press writers Christopher Sherman in Ciudad Juarez and Astrid Galvan in El Paso, Texas, contributed to this report.